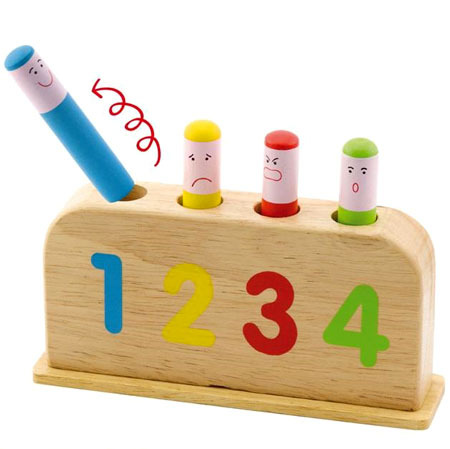 Springing Wooden Pop Up Toy is a sweet push down pop up toy which has numbers, shapes and different simple expressions. You can push down on the little people and they will "spring" right out of the base. A great toy which can be used in a number of ways. Your little one can fit the people into the holes, push them down, spring them out and as they get really good they can even catch them as the leave the base. This simple strong toy is a really fun and has a lovely smooth finish. Size: Base is 16cm long x 3cm wide x 9cm high. Pop ups are 9cm long. We like this because: "Very simple and lots of fun. My daughter and I tested this for a long time popping the people up and catching them in the box"